Convenience stores are small retail businesses, typically found off major highways and connected to fueling stations. Fuel is an important component of the convenience store business model, but you might be surprised to learn that these stores rarely turn a profit on petrol sales alone. Convenience stores sell nearly 80% of the fuel purchased in the US, but after credit card fees and other operating costs, net profit for gasoline sales averages 3 cents a gallon, according to the National Association of Convenience Stores. This is called a loss leader, or a product sold at a loss (or very little profit) to attract customers. So, C-stores need customers to purchase something from inside their market to see profits. Their purpose is baked right into the name, using a fueling station as bait, the stores bet on making commonly purchased goods and services easily accessible or “convenient.” Ease of access means customers will pay a slightly higher price than grocery stores. However, their extended hours, quicker check-outs, and easily accessible locations add value for travelers, commuters, or anyone in a hurry. For decades, convenience stores have been synonymous with quick stops. They’re known for slat walls stocked with smokes, sodas kept cold behind frosty glass doors and pre-packaged snacks. C-stores were an asset for travelers that didn’t have the time or inclination to stop at a typical store or restaurant. But times are changing. Highway hotspots are packed with convenient retail and food options that offer a better overall experience and higher quality products. Essentially, competitive businesses have improved upon the convenience model while still maintaining a high standard for exceptional, consistent experiences. The best C-Stores are those that prioritize giving customers the same experience at every location. This means the most successful stores are usually franchises. They’ve invested in brand standards, strategized on how they want their customers to experience their stores, and prioritized improvement. Now, they’re reaping the rewards. The old convenience store experience looked a little like this: Your customer stops to fill up his gas tank, and then maybe he wants to pick up a pack of smokes and a soda. When he pushes through the door a little bell clangs to tell you he’s there and he’s greeted by a room filled with lights that make everything look a bit yellow. None of the aisles are marked, forcing him to walk up and down each one until he finds what he wants. There’s a funky smell, a layer of grit around the POS, and mysterious stains streaked across the linoleum tiles. He says he needs to use your restroom. Don’t get me started on the restroom. And finally, once he’s located what he needs, or more likely discovered you only have a mediocre substitute, he walks up to the POS, juggles his handful of products onto the counter, and then pays way more than he expected when choosing out the items. Is he coming back? Owners are losing opportunities to sell their most profitable products (food, drinks, alcohol) because customers don’t want to come inside at all. Owners could also be eating into profits if wholesale gas prices are more than they’re able to competitively charge in the market (the major drawback of employing a loss leader strategy). If you’re lucky enough to get your customer in the door, you might catch his eye with your coffee or pre-packaged foods. But probably not, because the coffee tastes terrible, the food is low-quality and unhealthy, your beverage selection is limited to the big beer companies and sodas, and they all cost more than they would at a grocery store. Oh, look! What’s that across the street? A big-name C-store advertising their clean restrooms, a grocery store, and a handful of fast-food restaurants serving burgers, fries, and chicken sandwiches. If your customer only stopped to pump gas, and the Dunkin Donuts is a stone’s throw away, why even go into the convenience store in the first place? We know customers don’t want to wade through piles of junk food to get to unsanitary restrooms. So, C-stores need to rethink their customer experience. But what does that mean? Some smart convenience stores are betting on partnerships with successful quick serve restaurants, some are investing in their own brand of food service, and others are completely rethinking what convenience means in this retail landscape. To capture foodservice traffic from the pumps, C-stores had to involve already popular name brands to beef-up their foodservice offerings. Co-branding efforts with recognized foodservice companies like Subway and White Castle give food credibility to the convenience store. People have been burned by C-store food before, so tying-in a well-respected brand is often the main differentiator between competitive C-stores in the same market. However, these expensive franchise deals can be difficult to swallow and can result in poached sales from the market side of the store. As an alternative to expensive franchise deals, some C-stores are improving on their own brand of food service. The first thing to go? Roller grill programs. The industry has struggled to maintain a consistent quality across locations (which can be all over the country) with roller grill offerings. Most major brands are discontinuing these programs now in favor of proprietary, fresh-made meals and snacks. Sheetz is a perfect example of this paradigm shift and was the first convenience store of its kind. For nearly 30 years they’ve been pioneers in the fresh-made food arena. Their full-service kitchen also included a comparable fast-casual dining experience. We predict local gas stations will start to copy this model. Many companies are now in their first wave of debuting more elegant dining spaces, community tables, charging ports and Wi-Fi for your mobile devices. Once upon a time, the convenience factor could be a key differentiator for C-store brands. Now, technology has totally redefined what convenience means, and competitive industries are stealing market share. Although we don’t typically consider Walmart when we think of C-stores, they leaned into the literal meaning of convenience to add value to their customers. Much like a traditional convenience store, they offer fuel pumps and keep an on-hand inventory of grab-and-go items like sandwiches, coffee, milk, and bread. But the biggest game-changer is their grocery pick-up program. At Walmart Fuel Stations, employees gather and pack your grocery order (placed before 1 p.m.) from the Walmart nearest your C-store, deliver them in refrigerated trucks, and load them into your car for free. They started testing the concept in 2016 and soon after expanded the program into new markets. Providing a new offering can be a risky venture, even for giants like Wal-Mart. That made their testing phase extremely important. Not only were they able to determine the interest level within a single market, but they also performed the test with little risk. Why is this a Challenging Transition? Whether you’re interested in partnering with an existing QSR, starting your own proprietary foodservice brand, rethinking the customer experience, or looking to test a new concept, they will all most likely require construction. Adding a QSR: remodeling or reconstructing the space to provide a separate, defined, and branded area where the QSR employees may prepare and serve meals. Adding Proprietary Menu Selections: remodeling or reconstructing the space to include a kitchen that could range from minimal prep all the way to a full-service kitchen. Rethinking the Customer Experience: remodeling to define the flow, update finishes, rebranding etc. Unfortunately, construction on an operating C-store is bad for business. If you shut down completely you interrupt your customer patterns, lose short-term revenue, and risk long-term revenue if those customers develop a new pattern while you’re closed. If you remain open, but your store is a construction zone, it diminishes the customer experience and could be a safety hazard. One of the great benefits to our pop up shipping container C-stores is that they’re designed to be mobile. This means that during your remodels or reconstruction you can use a fully-functional mobile space to provide the same market services to customers. This keeps them from walking through a construction zone and minimizes the risk that your competition may poach your loyal customers. And, if you’re remodeling more than one store, you can pick up the container and move it to each location. Because our shipping containers are used as modular units, they almost completely remove construction from your plan. We are able to modify shipping containers or purpose-built modular structures into a kitchen unit in our warehouse. Then we deliver the completed structure to your site. We can either add the kitchen outside of your space or incorporate it into your existing building. Once it’s tied to power and water, all you have to do is switch it on. In new-build situations, owners can streamline the process and start serving customers immediately with usable retail space. For instance, we built an 8-foot by 40-foot purpose-built structure for RaceTrac. It looks like a traditional shipping container, but it is 10 feet, 4 inches tall – taller than any standard model container. And it’s stocked with all of the modern conveniences, right down to the hot coffee. Walmart can afford to beta test without suffering a huge loss, but can you? If you have to build completely new construction on every lot, your answer is probably “no.” Buying or leasing a space, upfitting it properly, and securing permits is time-consuming and costly. And when you finally choose a spot, you have to hope that you picked well. 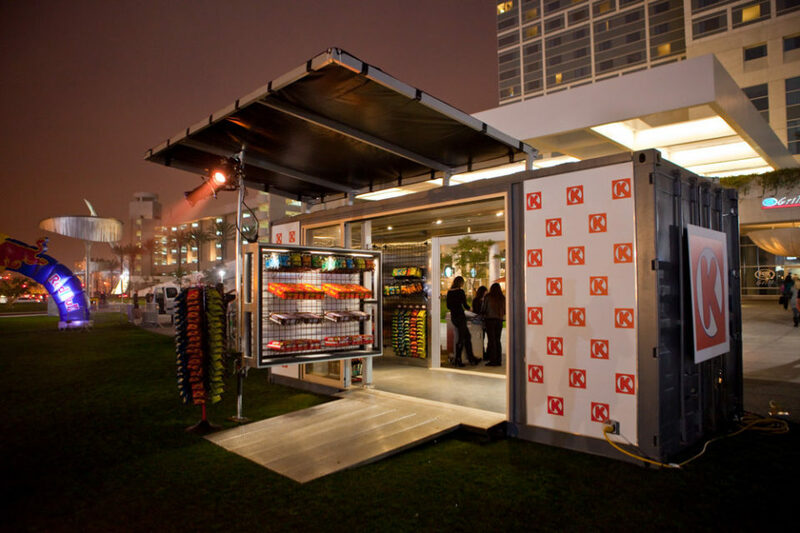 A pop up C-store allows you to get a feel for customer habits, expectations, traffic patterns, and competitors. With our mobile or semi-permanent solutions, you have the flexibility to put down roots or take your concept to a more receptive market.